About 2 years ago I was looking for something in my old camera bag when I came across a camera I didn’t recognise. 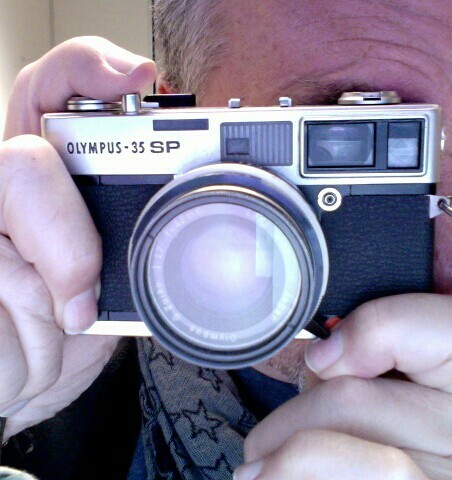 It was an Olympus-35SP and I had no idea where is had come from*. I had a look at it and downloaded a manual from the internet. I discovered that it needed a battery so I bought one from Maplins. I then loaded it with a film and put it in my bag when I went on holiday that year and spectacularly failed to use it. It had then sat unused until a month or so ago when I made a conscious effort to start taking photographs using film again. So I put it in my bag and this time I actually used it! * In the intervening period I think I worked out that it was given to me by a colleague at work around 15 years previously so I calculated that it hadn’t been used in around 20 years. 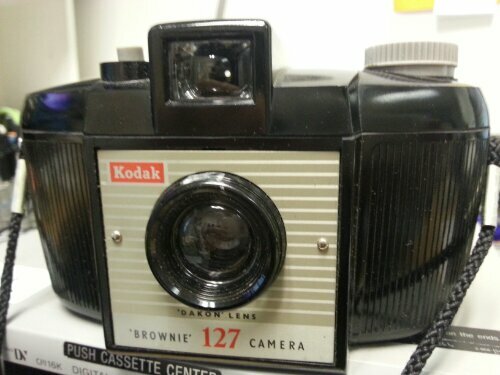 The camera dates from the early 70s having been manufactured between 1969 and 1976. It’s a rangefinder camera where you focus through a separate viewfinder by moving a ring on the lens until two little squares coincide. It also has a built in exposure meter which with both spot and center-weighted readings. The camera operates in both automatic and manual settings. The one thing I was worried about was that the exposure meter may not be giving the correct readings due to it’s age or the fact that the battery had been in the camera for over a year. However when I checked the reading it was giving against the ones given by the various apps on my mobile they all gave very similar readings so I felt it was ok to use the automatic mode when shooting the test film. 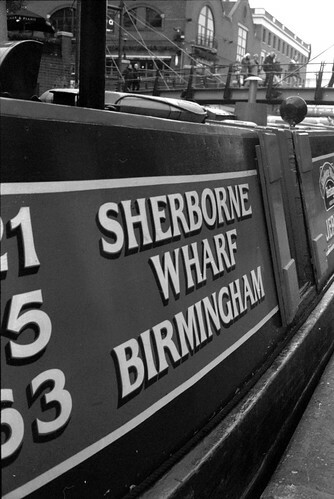 The camera went to some of the same places as the Kodak but the first port of call was in Birmingham. 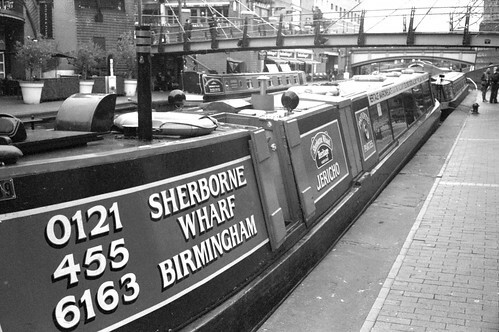 I was working at the ICC and as we walked in on the first morning I spotted some narrow boats on the canal outside so when I had a chance I popped out with the camera and took some shots. As I indicated above it had been a while since Ihad put the film into the camera so I had no idea what it was except that it was 400 asa so I thought the brightly coloured narrow boats would be a good subject. 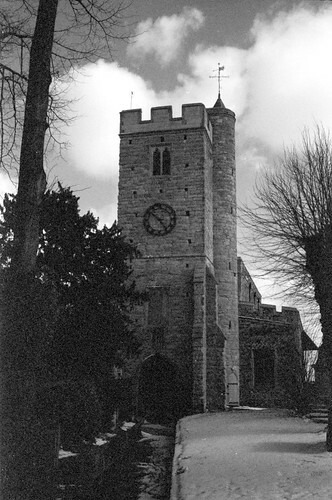 Sadly when I took the film out of the camera a few weeks later I discovered that it was infact Kodak Tmax Black and White film so all of my thought about colour had gone out the window! I finished off the film in this camera at the same time as the one in the Brownie when I went out for a walk in the freezing cold on that snow day a few weeks back. 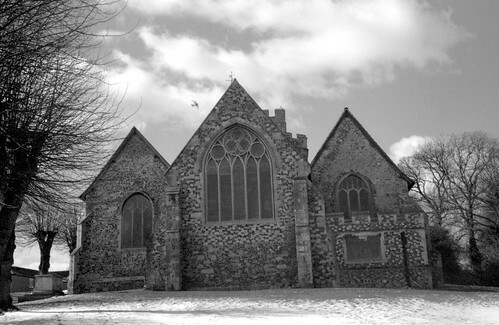 I shot some pictures of the local church which is also the oldest building in the area and then went down to the riverside where the bitter cold seemed to mist up the lens at one point! 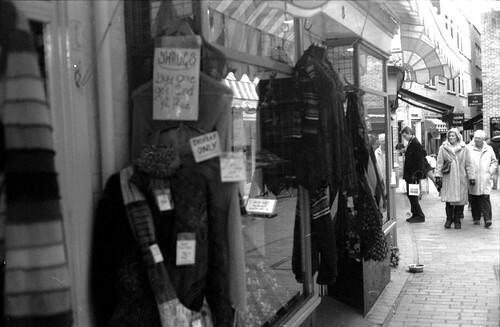 It was here that I rewound the film and opened the camera only to find the film was black & White! Oh well never mind! Enthused I headed back to the shop hoping it was still open which thankfully it was. 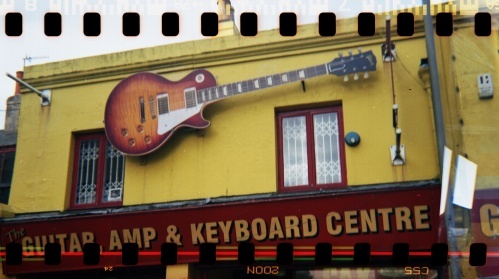 I bought the camera and then headed to Poundland where I bought a couple of rolls of 35mm film. A couple of days later I put a film into the camera. 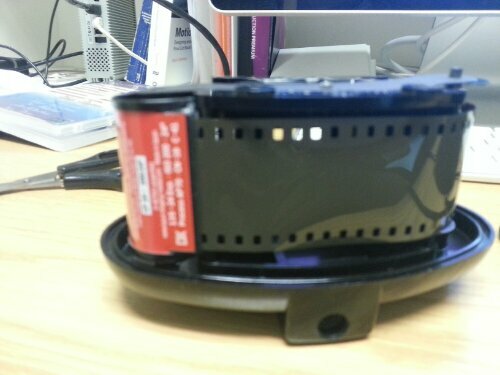 However as it mentioned in the video before you can use 35mm film in it you need to make a couple of minor alterations! The 127 film was, like 120 film, backed with paper and the exposure numbers were on the backing paper. 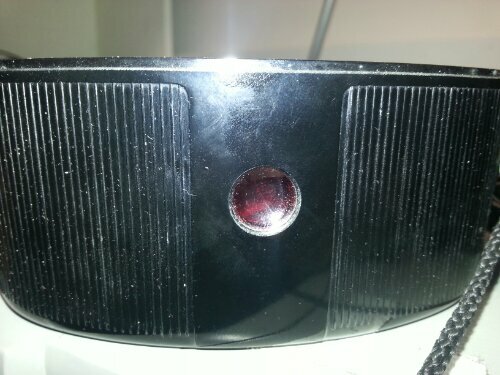 These were viewed through a little red window at the back of the camera. The problem is that 35mm film isn’t backed by paper and any light coming in through this window will burn into the film so it needs to be covered up. I did this by using a combination of card and pvc tape. I put on several layers just to be on the safe side. 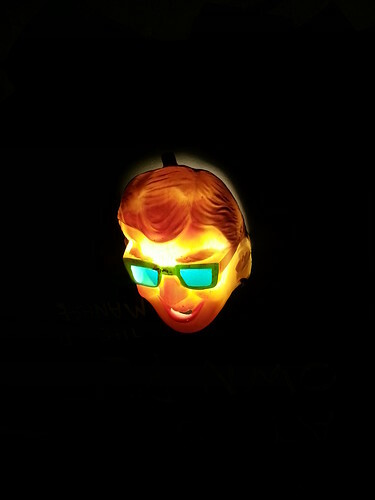 I decided that it was safer and easier to do this on the outside of the camera. Then it was just a case of putting a film into the camera. 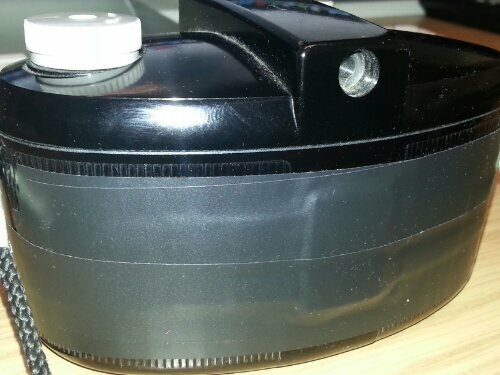 Obviously the film isn’t meant to fit but once the film was attached to the take up spool it stayed in place ok. The video I’d watched on youtube showed using some sort of washer to hold it in place but I didn’t have anything that fitted. The camera was manufactured between about 1959 and 1963 and is a simple camera with fixed aperture (about F11) and shutter speed (about 1/50 second) which makes it a camera that can really only be used in bright sunny conditions which as you may have noticed have been in rather short supply recently! 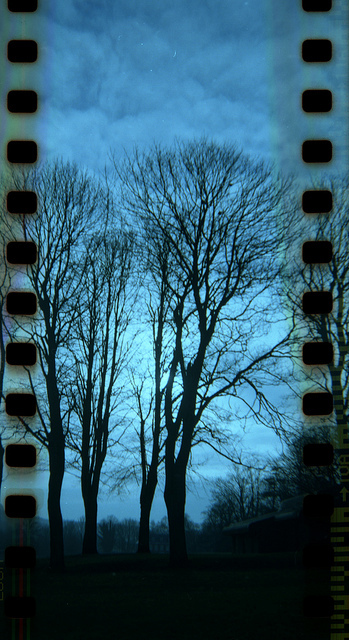 Also without the numbers on the back of the film it’s rather difficult to know when the film has been wound on sufficiently to avoid double exposures (although this does offer an interesting possibility in itself!) After reading various posts on the internet I wound the film advance knob through 2 full revolutions after every shot and that seemed to work. The effect I was looking for was obviously the exposed sprockets meaning the image goes right to the edge of the 35mm film. I had created some images like this using retro camera on my Android phones but it looked a bit fake (which obviously it is!!) 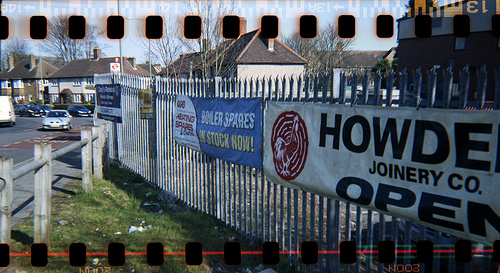 I’d made a camera wish list on this blog recently and one of the cameras I’d mentioned (albeit as being too expensive) was the Lomography‘s Sprocket Rocket which retails at around £70. This gave exactly the same effect for less than a fiver!! I took the camera out with me for a couple of weeks and took some pictures in London, Brighton, Elmers End and Chatham! The only downside is that the film can’t be rewound inside the camera so I had to find my old changing bag and wind the film back into the canister inside that. 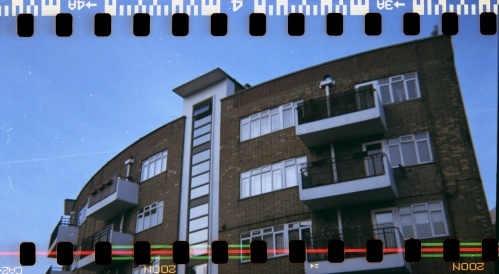 I sent off the film to AG Photolab to be developed and here are some of the results – the format gives a nice widescreen effect and of course sprocket holes! 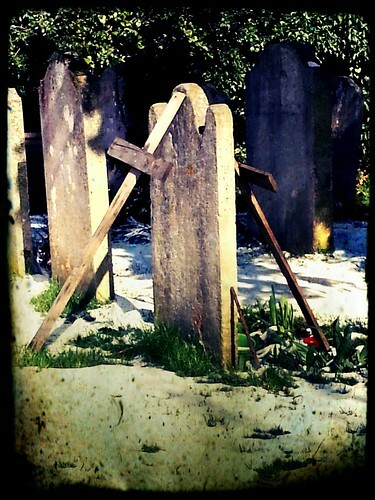 Double Cross, a photo by deadheaduk on Flickr. Disembodied Head, a photo by deadheaduk on Flickr.